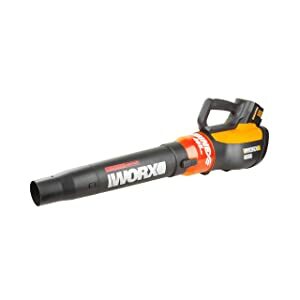 There are few lawnowners who have never come across a WORX product, or even more specifically, the WORX Trivac leaf blower, which won the Product of the Year award at DIY Tools. That achievement, however, was back in 2011, and a lot of blowers have moved through WORX’s assembly lines. Hence, while the updated versions of the original Trivac are still widely available, a fresh look at this new but amazing entrant to the world of garden tools is in order. To make life easier for you, we have gone through WORX’s huge catalogues and managed to come up with three candidates for the crown of the best WORX cordless blower of 2019. Part of the new series of PowerSave blowers from WORX, this 56V beast delivers a whopping 600CFM at its full speed of 125mph, allowing for hurricane-grade clearance of your lawn. This is courtesy of its impressive fan and nozzle design, which hold up well even when the blower is used for hours on end at high speeds during the fall. As one would expect of a premium blower, this unit possesses an easy-to-access speed control mechanism. More impressive from the customer perspective though, is that the blower weighs a mere 8.1lbs. While the battery proved to be a bit underwhelming for some users, the combination of speed, weight and ease of use can prove to be too much of a bargain for most landowners to refuse. Battery compartment management and charging procedures can be somewhat tiresome. Stepping down a rung in terms of price, we get the mid-range 32V unit, which is capable of pumping out a still impressive 120mph maximum speed. While its 80CFM clearance may pale in comparison with the premium category, it still handily beats the competition at its price point. 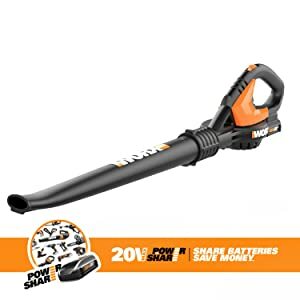 Indeed, it may well be regarded as an ultra-compact blower that doubles up as an in-house cleaning tool for all the dust accumulating from the countryside or road. Backing up its claim to being a multi-purpose tool is a good number of attachments. Combined with its impressive 4 lbs weight and the ability to run for 30-40 minutes on a single charge, these features make the 32V WORX blower a compelling buy for small and medium lawn-owners on a budget. Decent clearance, even when dealing with in-house dust and debris. Gutter clearance is not always up to the mark. Nestled between the price brackets of the above two products is our WORX 20V unit. Boasting of similar speeds, it has an 80CFM output that can be extensively modified to suit the task at hand. Users variously found it useful for removing weeds, cleaning patios and even doing the occasional cleanup inside the house. 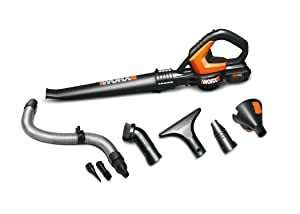 This is possible because the nozzle itself manages to pump out sufficient air regardless of the attachment, and the attachments themselves are hardy and well-designed. In terms of weight, the 6.2 pounds of lifting power demanded is well compensated by the rapid pace of clearance and the ergonomic design. This design, unfortunately, does not extend to wall mounting, since the keyhole required for it isn’t present. That aside, however, the overall design and the excellent charging and output of the battery combine to ensure that folks with medium yards would find this unit one of the most value-for-money ones in the market today.